Redmi Note 5A May Arrive on August 21; Higher-End Models Also in Works - Playfuldroid! The Redmi and Redmi Note series of smartphones are highly popular smartphones from Xiaomi as they come plenty of features and cost-effective pricing. In India, Xiaomi has sold 5 million units of Redmi Note 4 since its launch in January. Rumors have it Xiaomi is prepping on the successor phone for Redmi Note 4. In the past week, an alleged image and specs of Redmi Note 5A had appeared. The Redmi Note 5A appears to be a low-end version. The company is also expected to unleash Redmi Note 5 with higher specs. 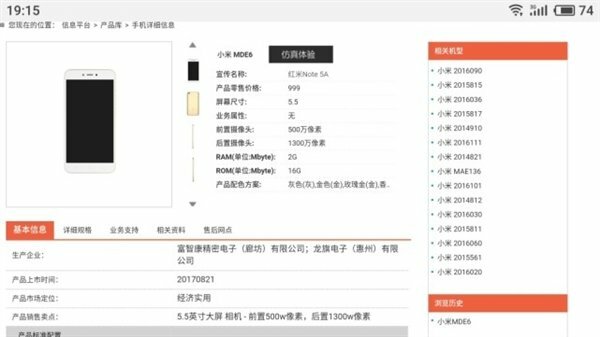 A Chinese publication has reported that a Xiaomi device with model number MDE6 powered with Snapdragon 425 chipset, 2 GB of RAM, and 16 GB of storage has been found listed with a telecommunications agency in China. Fresh information suggest that it may go on sale on Aug. 21 and there will be customized versions for China Mobile and China Unicom carriers in the country. The other specs of the phone include 5.5-inch HD display, 13-megapixel rear camera, 5-megapixel selfie camera, 3,080mAh battery, and Android 7.1 Nougat OS. It may also arrive in 3 GB RAM option. It is expected to be priced at $999. The model numbers MDE6S and MDT6S are said to be high-end editions of the phone. These may feature 5.5-inch FHD display, Snapdragon 625 chipset, 3 GB and 4 GB RAM variants and rear-mounted fingerprint reader.